On the drive south, we saw a beautiful Sierra wave, with sunset light, at about the Carson Valley. I took a picture. These are lenticular clouds, indicative of high wind at high altitudes. Being a Labor Day holiday weekend, a group of four all met, at noon the 5th, at the Post Office In Bishop, CA. This was the printed schedule directive by the trip leader. We had an attorney, his companion, and a CSUS professor. Unfortunately, the trip leader failed to show up. I understand this is a vaunted tradition among trip leaders in the chapter that he was from. Lucky for us, the rest of us were mostly experienced mountaineers. I assumed responsibility. I obtained a permit, and led this group up to the overflow parking for the South Lake Trailhead. Parked cars stretched out along the shoulder of this two-lane mountain road. I left a note, for the leader if he was just late, at the trailhead message board. 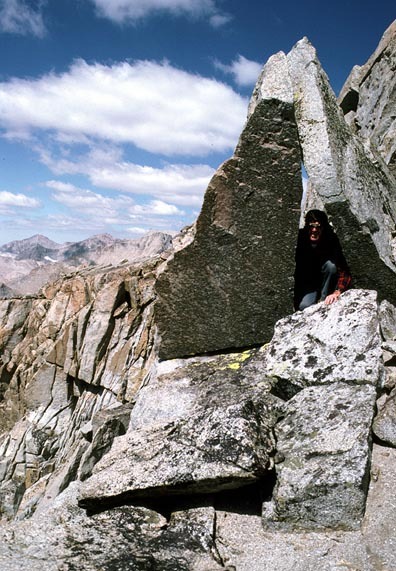 "Climbing G. and J.," otherwise a peak climbers' code for Gilbert and Johnson, two High Sierra peaks that I needed personally. I sought to continue the climbing completion of the named points on the Mt. Goddard 15' quad as well as the peaks within the Bishop Creek watershed. We started up the trail at a late hour. Our base camp, Treasure Lakes, wasn't very far of a hike. We camped past the farthest lake, and enjoyed the long shadows of the evening. The next day, with a sight of the dawn light on Mt. Johnson, only Cliff, the professor, chose to do the peaks. I have really to compliment myself on my route-finding. I found a class three diagonal ledge to save some distance. This isn't described in any guidebook. This ledge brought the two of us to the Sierra Crest. From here, we rounded a small peak, then ascended the sandy, class 1-2 southern slopes of Mt. Gilbert. Enjoying the views and reading the register, I saw the entry of another climber I knew. He had completed a solo traverse between the two peaks. I guessed that the route couldn't be more than class 4. In a spirit of high adventure, we chose to explore this ridge run. The going was easy enough past our crest arrival point, then some scrambles were necessary to save some elevation drop. Then we came to the steeper, broken rock that leads up to the summit of Mt. Johnson. I went ahead, leading the way. I climbed up, checked the route, and yelled back at my companion to follow. The going was good, till a large block on the ridge prevented direct travel. The left side was impassable, with a substantial drop. The right side required just a big step over an open book, with perhaps 20 feet of exposure. I did that, holding my breath, not positive that the rock would be solid. It was. Cliff followed, then we continued to climb over boulders to another necessary move. A blunt knife-edge led to another ledge, with two slabs tilted against a wall. We had to crawl under them. This was a good photo op. A short section, onto a class 3, high ledge, then up along it to the top, finished the ascent. The weather and vistas were beautiful. We saw and heard a tremendous rockfall on a chute in the Palisades to the south. I imagined that some climbers had really done it, and we would read about it in the news. I heard nothing later. A big cloud of dust, several miles away, was visible. If a tree falls in the forest, does it make a sound? Yes! There is a class 2 walk-off down the south side of Mt. Johnson. We were soon back at camp, then decided to pack out. I took a look back at the peaks from South Lake. I drove us north on U.S. 395 to camp, then Monday, the 7th, we hiked into what is now the Carson-Iceberg Wilderness. Beginning at Rodriguez Flat, we hiked a loop along the Silver King Creek. The large, magnificent juniper trees made for endless photo ops. However, it was warm, so we became tired and bored. The terrain is largely sagebrush and dirt soils, a real change from the steep granite on which we had spent a good part of the day previous. We drove home after this hike, content that we had climbed two peaks, although they were not both listed on the local NAS list. Some other climbers considered that important. They are both on the SPS list. I was to take climbers over this same traverse two more times. Other groups climb each peak on a separate day climb. I like class three routes. Taking many pictures to show the route, someday, I had planned a picture guide for the peaks. This climb and experience will stay fresh in my memory. One must just know the way, and it's easy. 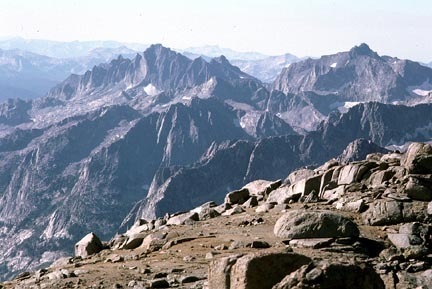 But, being two fairly nondescript peaks, with higher and more challenging peaks on both sides along the crestline, not many will venture to do these.